The Panchanga (Hindu calendar) is based on lunar months and has twelve months of 29.5 days, totaling 354 days. As a result, many Hindu festivals move back 11 days on the Gregorian calendar each year. To offset the difference, the Panchanga adds an extra month approximately every three years. It also tracks solar months, based on the sun’s movement among the zodiac signs. Religious holidays generally follow lunar months and civil events follow solar months. In most cases, festivals fall on the new moon or on the day after the moon phase. The Hindu religion includes numerous communities and regions that follow different lunar and solar calendars. Thus, believers celebrate the New Year at various times during the year. 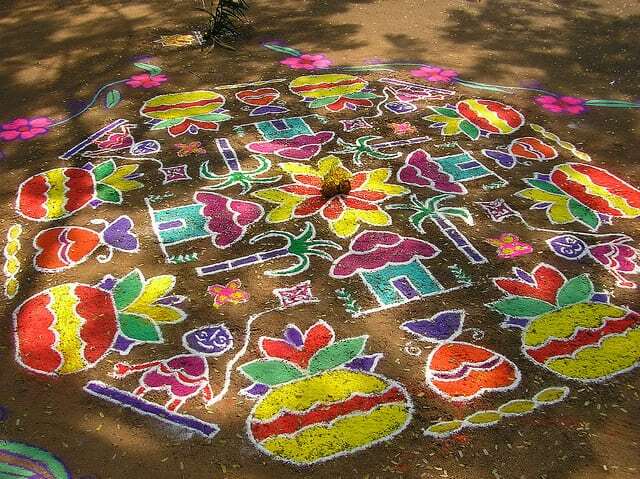 Customs also vary but common ones include decorating entryways with colorful kolam (or rangoli) designs, making offerings to gods, visiting family and friends, and feasting. Nyepi. Bali, Indonesia follows a version of the Saka calendar and observes the New Year on 1 Kasa, usually March or April. Saka New Year. This holiday falls on the first of Chaitra in the Government of India Saka calendar. It usually corresponds with March 22, or March 21 in leap years. Many areas of India observe New Year’s on or around 1 Chaitra in the Vikram Samvat calendar (usually March or April). Northern India and Nepal observe Nav Varsh Samvat, the Hindi New Year, and Kashmir state celebrates Navreh. In central and southern India, the Telugu and Kannada communities observe Ugadi and Maharashtra state celebrates Gudi Padva. This date is also the start of the nine-day festival known as Chaitra Navratri or Ramayana Week, which ends on Ram Navami. Bestu Varas. Gujaratis follow the Vikram Samvat calendar but celebrate New Year on the day after Diwali. This is the month of Kartik, usually October or November. 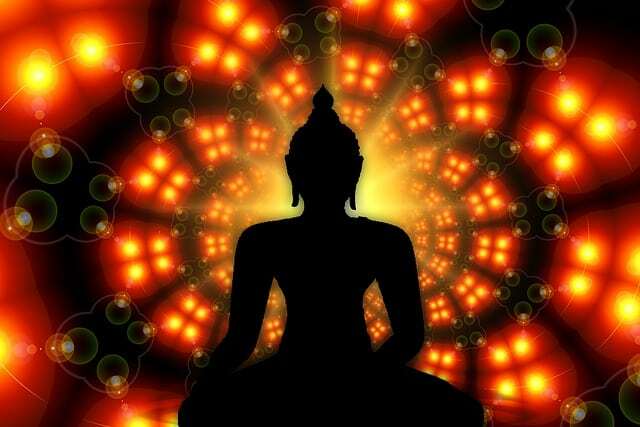 On the Hindu solar calendar, many New Year observances fall on April 13, 14 or 15. These include Vaisakhi in north and central India and Poila Baisakh in Bengal. Tamils celebrate Varusha Pirappu on 1 Chithirai and Kerala residents observe Vishu, the Malayalam Zodiac New Year, on 1 Medam. Vaisakhi (or Baisakhi) is a major harvest festival and New Year celebration in Punjab and other northern India states. It falls on the first of the month of Vaisakh (April 13 in most years) and marks the solar new year. Hindus across India observe the day with different names and customs. Sikhs also observe it as an important holiday marking the New Year and the start of the Khalsa warrior community. Vaisakhi is a joyous and colorful time of thanksgiving, dance, music and feasting. People wear new clothes and jewelry, perform the traditional Bhangra and giddha dances, visit friends and exchange gifts. Ram Navami, the birthday of Lord Rama, is an important festival for Hindus. The Vaishnava sect in particular honors Rama as the seventh avatar of Vishnu. In Northern India, Ram Navami falls on the ninth day of the Chaitra Navratri festival, usually late March to mid-April. Hindus in South India celebrate the nine days as the Ram Navami festival. Many believers fast on this day or throughout the nine days. They pray for Lord Rama’s blessings, offer flowers and fruit and decorate temples and images of him. Many temples organize reenactments and nonstop readings of the holy epic Ramayana. Raksha Bandhan (“bond of protection”) celebrates the relationship between brothers and sisters. The festival, also called Rakhi or Rakhi Purnima, falls on the full moon day of the month of Shravan. Jains and some Sikhs observe the festival along with Hindus throughout India and parts of Pakistan. On the morning of Raksha Bandhan, a sister and brother gather with their family as she ties a rakhi (sacred thread) on her brother’s right wrist. This symbolizes her love and prayers for her brother’s well being, and renews his lifelong vow to protect her. Also called Srikrishna Jayanti, this day honors the birth of Krishna, the eighth incarnation of the God Vishnu. Hindus celebrate the event by fasting and staying up until midnight, when Krishna is thought to have been born. They place images of the infant Krishna in swings and cradles in temples and homes. 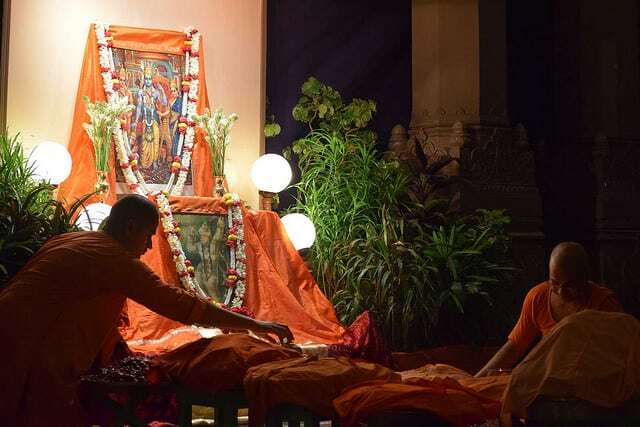 At midnight, devotees gather around for devotional songs, dance and exchange gifts. Some temples also hold readings of the Bhagavad Gita scripture. Ganesh Chaturthi (also called Vinayaka Chaturthi or Vinayaka Chavithi) is a 10-day festival honoring the god Ganesha. One of the best known Hindu deities, Ganesha is easily recognized by his elephant head. 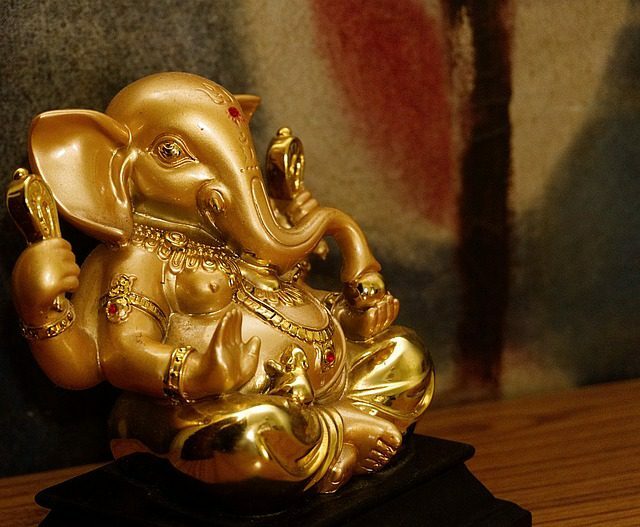 He is worshiped as the god of beginnings, wisdom, and arts and sciences, and as the remover of obstacles. Ganesh Chaturthi begins on the fourth day of Bhadrapada in the Hindu calendar (usually August or September). Throughout the festival, celebrants offer food, sweets and prayers to clay statues of Ganesha in their homes and on public stages. Traditions include chanting of Vedic hymns and Hindu texts, prayers, and vrata (fasting). On the 10th day, people carry the statues to a nearby river or ocean and immerse them. As the clay dissolves in the water, Ganesha is believed to return to his parents, the god Shiva and goddess Parvati, on Mount Kailash. Pitru Paksha (“fortnight of the ancestors”) is a 15-day period that begins on the first full moon after Ganesh Chaturthi. The festival is also known as Shradh. During this time, Hindus honor their pitrs (ancestors) with rituals (shraddhas), food offerings and scripture reading. They eat vegetarian food and avoid certain actions: engaging in new endeavors, shaving, getting haircuts, and eating onions, garlic or junk food. Shraddhas usually include three parts: Pindadan, or offerings of pinda (sweetened rice balls) to the ancestors; Tarpan, offerings of water mixed with kusha grass, barley, flour and black sesame; and Feeding the Brahmin, giving food to the Brahmin priests. Hindu women observe Karwa Chauth each year in the month of Kartik, four days after the full moon. It coincides with Sankashti Chaturthi, a fasting day for Lord Shiva, Parvati and Lord Ganesha. On this day, married women fast for their husbands’ longevity and their families’ happiness. Unmarried women also fast for their future husbands. 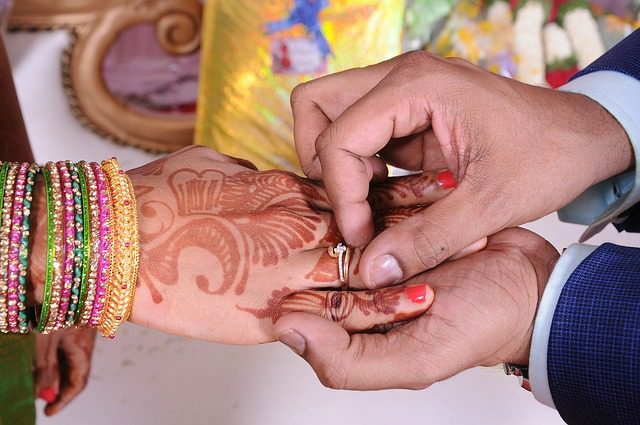 Very early in the morning, women dress in wedding finery: a red outfit, jewelry and mehndi, henna designs on their hands. Starting at sunrise, they eat or drink nothing until evening. The women break their fast only after sighting and making offerings to the moon. Married women take their first bite from their husband’s hand. Karwa (or Karak) refers to the earthen pots in which the women offer water to the moon. Four days after Karwa Chauth, mothers observe Ahoi Ashtami Vrat, a fast for the well being of their children. Navratri (“nine nights” in Sanskrit) is a festival that takes place four times yearly. 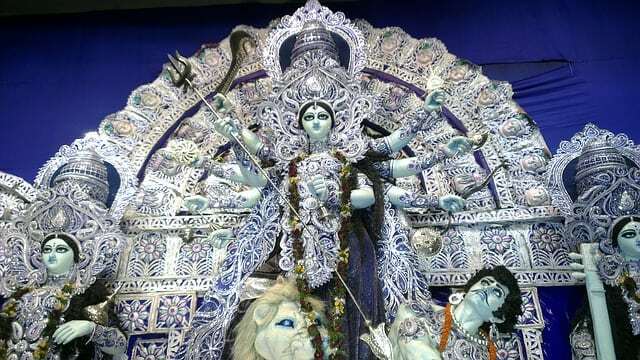 The most widely celebrated is Sharada Navratri (or Durga Puja Navratri). It starts on the first of Ashvin, in September or October. The other important observance is Chaitra Navratri, which begins on the Hindu New Year (usually March or April). The colorful 10-day, nine-night holiday honors Durga, the universal mother, also known as Shakti or Devi. In eastern and northeastern India, Navratri is synonymous with Durga Puja, which commemorates Durga’s victorious nine-day battle with a demon. During the festival, celebrants worship and fast in the mornings. They follow specific rituals each day, such as wearing a certain color. The evenings are filled with feasting and traditional dances. Other customs include stage decorations, plays retelling the stories, and scripture readings. Dussehra (also Dasara or Vijayadashami) celebrates the 10th and last day of Navaratri and the triumph of good over evil. In much of India, the day commemorates Lord Rama’s killing of Ravana, as told in the Hindu epic Ramayana. Ravana is a follower of Shiva and a great scholar and ruler, but someone who wanted to overpower the gods. Ravana also kidnapped Rama’s wife, Sita, in revenge against Rama and his brother, who cut off Ravana’s sister’s nose. Across India, Hindus burn effigies of Ravana with fireworks, symbolizing the destruction of evil. 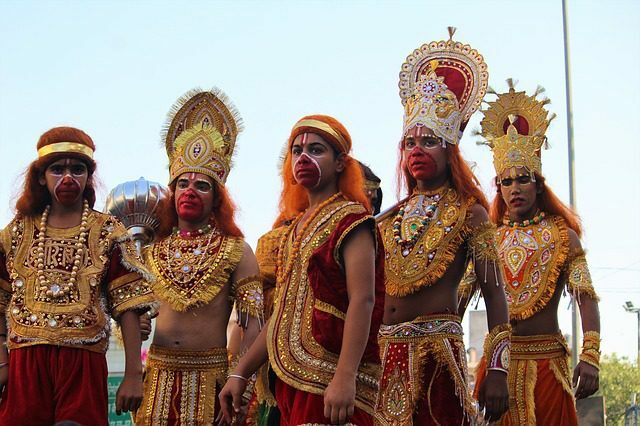 Believers also reenact Durga’s and Rama’s victories and walk in procession to bodies of water to dissolve clay images of Durga, Lakshmi and other deities. Diwali, or Dipawali, is India’s most important holiday, as vital for Hindus as Christmas is for Christians. Taking place 20 days after Dussehra, the festival usually falls in October or November. 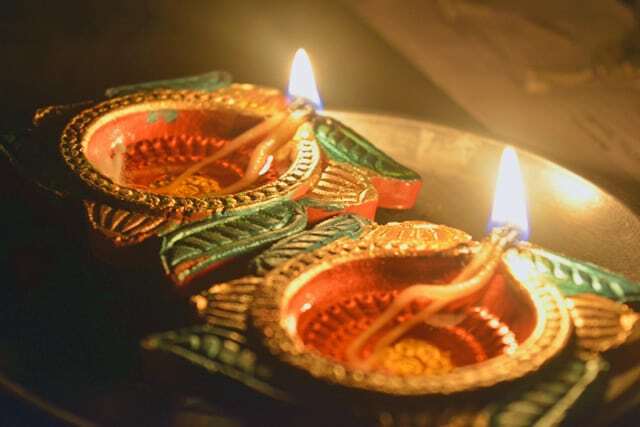 It is named for the row (avali) of clay lamps (deepa) that are lit to symbolize the inner light that protects from spiritual darkness. Historically, Diwali marked the last harvest before winter. 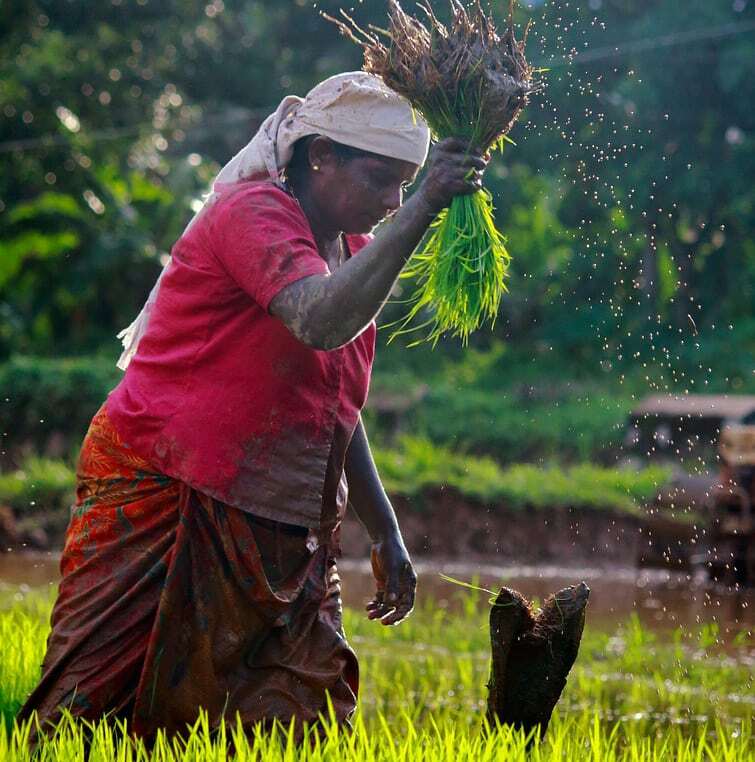 With India an agricultural society, people would seek blessings from Lakshmi, goddess of wealth, as they closed the year’s accounting and prayed for success in the new year. 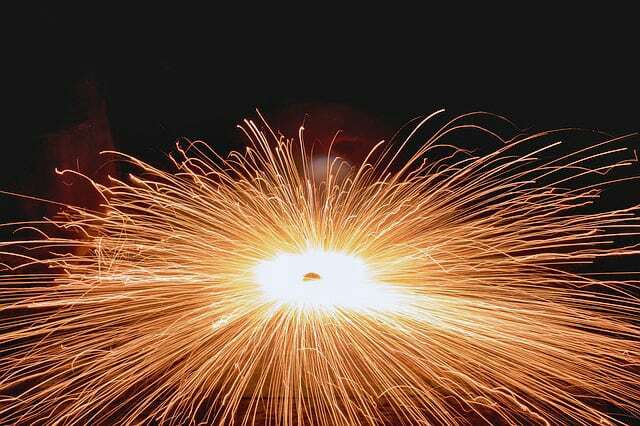 To this day, businesses across the Indian subcontinent start the new financial year on the day after Diwali. 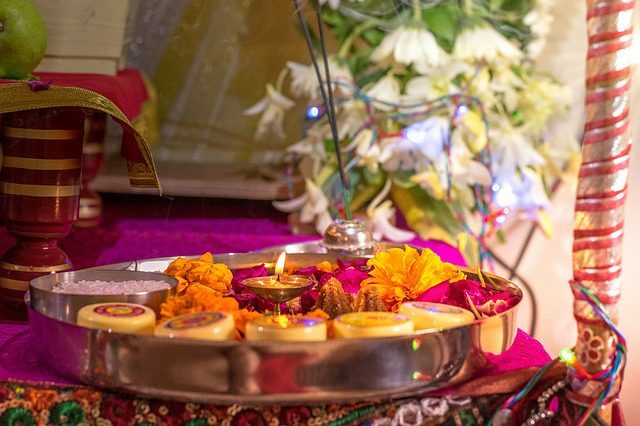 Over time, Diwali has become a day celebrated by most Indians regardless of faith. Customs include family gatherings, fireworks, strings of electric lights, bonfires, flowers, sweets, and worship of Lakshmi. As the goddess of wealth and prosperity, both material and spiritual, Lakshmi means good luck to Hindus. 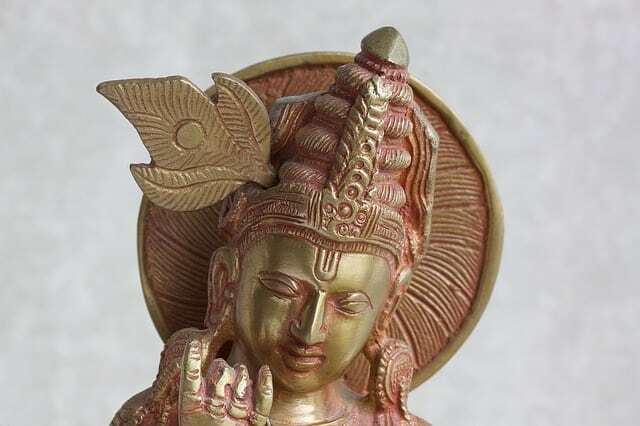 Lakshmi is the household goddess of most Hindu families, and a favorite of women. The word “Lakshmi” is derived from the Sanskrit word “Laksya” (“aim” or “goal”), and “puja” is the act of worship. Although she is worshipped daily, Lakshmi’s special month is the festive month of October. In the Indian states of West Bengal, Orissa and Assam, Lakshmi Puja is celebrated on the full moon night of Kojagari Purnima. Most people in India, though, worship Lakshmi during Diwali. On the evening of Diwali, when Lakshmi is thought to roam the earth. Hindus open their doors and windows and place diya lights on windowsills and balconies to welcome her. They wear their best clothes and offer pujas. Mothers, who are seen to embody the prosperity of Lakshmi, are honored by the family. Following the pujas, people light fireworks to both celebrate and chase away evil spirits, and then enjoy a feast. Indian and Nepalese Hindus celebrate Maha Shivaratri on the new moon day in the month of Maagha (February or March). The festival celebrates the start of spring and the overcoming of darkness and ignorance. This “great night of Shiva” is dedicated to Lord Shiva, known as the destroyer of evil. Each lunar month has a Shivaratri, but Hindus believe Maha Shivaratri is the most spiritually important one. On this day the earth’s northern hemisphere is positioned to bring a surge in human spiritual energy. Thus, one of the festival’s main traditions is to stay up all night to take advantage of this energy. Other customs include prayers, fasting, meditating and visiting Shiv temples or community events. 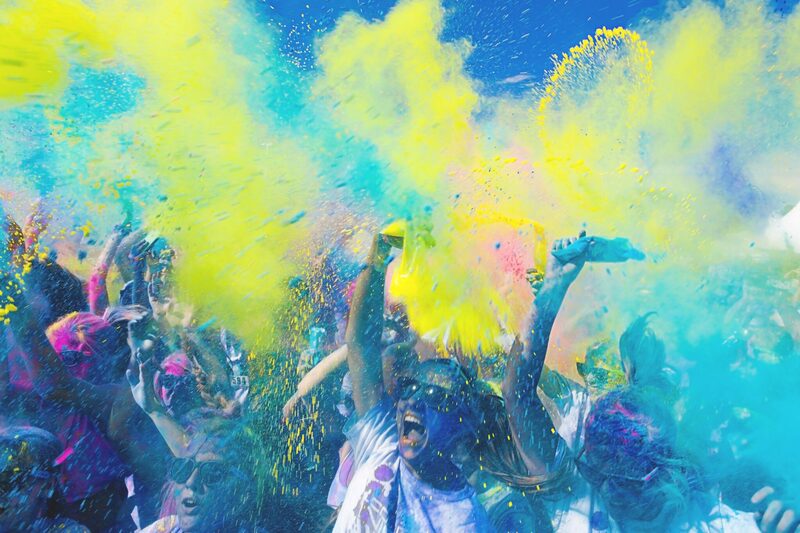 Holi, the Festival of Colors, is one of India’s most popular and joyous events. Hindus, Sikhs and people of all beliefs observe the holiday, which celebrates the triumph of good over evil and the start of spring, Holi begins on the full moon day in the month of Falgun. On the first evening, Holika Dahan, believers light bonfires to symbolize victory over evil. The next day, Dhuleti, brings the best-known custom in which people playfully throw colored powder and water on each other. One explanation is that this re-enacts a prank played by Lord Krishna. He was said to be saddened by his dark complexion, compared with Radha’s fair one. One day, Krishna’s mother jokingly suggested that he could change Radha’s complexion by smearing color on it. Delightedly, he did so and thus began a centuries-long tradition.